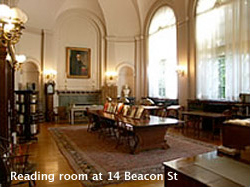 The Congregational Library was formed in 1853 and is located in Boston's historic Beacon Hill. The Library holds over three hundred years of records documenting the history of American Congregationalism. Their collection includes a wide variety of resources on American religion, New England history and contemporary and classic religious material. Plimoth Plantation is a living history experience dedicated to the Native Wampanoag and Pilgrim colonists of the 17th centery Plymouth, MA. It features costumed interpreters and modern day artisans overlaooking Cape Cod Bay. The 100-acre campus recreated the 17th Century Engilsh Village. For more information go to http://www.plimoth.org/. Burial Hill. Another stop along the Pilgrim's Path is Burial Hill. This is one of the first forts of the Pilgrims. It is also the burial place of William Bradford and other early settlers. The Mayflower II is a replica of the ship that carried the Pilgrims to the New World. Interpreters portray actual passengers and crew. While visiting the Mayflower II you will also see the famous Plymouth Rock located on the water front.